SAN FRANCISCO, CA--(Marketwired - Jun 20, 2013) - Skava, the leading provider of mobile, tablet and in-store technologies to more than 20% of the Top 30 Internet Retailers in America, today announced the results of the "Skava Consumer Mobile Shopping Survey." The survey, conducted online by Harris Interactive on behalf of Skava, asked 2,085 U.S. adults aged 18+ about their experience when shopping on smartphones. 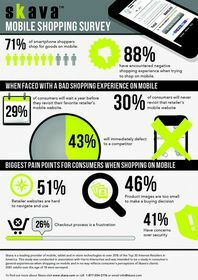 The trend to shop on smartphones is growing, with 71% of smartphone owners saying they shop using their mobile device. However, mobile shopping experiences fail to meet consumer satisfaction, as 88% of those who shop on their smartphone have experienced negative issues. This survey was conducted online within the United States by Harris Interactive on behalf of Skava from May 29-31, 2013 among 2,085 adults ages 18 and older, of whom 744 were identified as smartphone shoppers. This online survey is not based on a probability sample and therefore no estimate of theoretical sampling error can be calculated. For complete survey methodology, including weighting variables, please contact Danielle McCormick. Skava is a leading provider of next-generation multi-channel e-Commerce solutions to retailers. The SkavaONE™ "Omni-Commerce" platform allows retailers to create mobile websites and apps, tablet websites and apps, interactive digital catalogs, in-store kiosk applications, and social commerce offerings from one integrated platform. The SkavaONE™ platform works along with the retailer's existing e-Commerce platform and helps the retailer extend the online shopping experience to all these other customer "touchpoints" through customized and unique user experiences. Skava is recognized in the industry for providing a flexible and advanced platform which is able to adapt to the most complex e-Commerce requirements. Skava's customers include 20% of the Top 20 online retailers.